Dr. Peltz and Registered Holistic Nutritionist Krista Parr are teaming up once again to chat all about eating well for optimal fertility. Have questions about the best way to eat when trying to conceive. 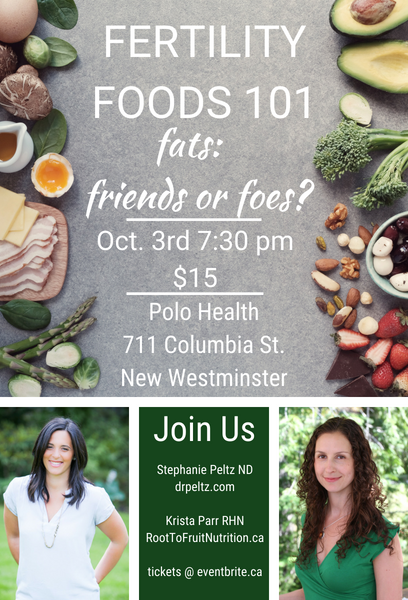 Join us at my New Westminster location Polo Health and Longevity on Wed Oct 3rd for a discussion all about fats and fertility... Friends ? or Foes? She will be discussing common pregnancy related complaints, see you there! Discussing all things relating to infant health with a focus on fevers. Come join us!! Discussing naturopathic treatments for postpartum recovery, and answering questions for all you new pom moms!! Need a boost in your energy / mood / immunity / metabolism? B12 is the vitamin for you! All moms are invited for 5$ B12 shots throughout the month of May. Offer valid for new and existing patients, appointment is required. Book yours today! !